WTF President Chungwon Choue, who also serves as president of the Korean Fair Committee Chairman, poses with prizewinners of the 2nd Korean Fair Play Award in a ceremony at the Olympic Parktel in Seoul, Korea on Nov. 20, 2008. Since 2007, the Korean Fair Play Committee has awarded Korean Fair Play prizes to Korean players and sports associations annually. 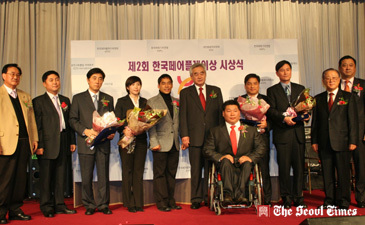 The Korean Fair Play Committee (KFPC), led by WTF President Chungwon Choue, held its second Korean Fair Play Award ceremony in Seoul, Korea on Nov. 20, 2008. The awarding ceremony was held at the Olympic Parktel in Seoul, drawing hundreds of sports figures. A six-member KFPC Screening Committee selected the 2008 Korean Fair Play prizewinners after strict selection sessions, mainly based on the applicants' outstanding examples of fair play attitude and good sportsmanship in sports. The committee's conviction is to regard fairness as more important than winning at all costs. In the men's individual division, Lee Bae-young, the silver medalists in the weightlifting at the 2004 Athens Olympic Games, earned the honors as the recipient of the 2008 Korean Fair Play Award. The honors in the women's individual category went to Dang Yea Seo, the bronze medalist in the women's team table tennis at the 2008 Beijing Olympic Games. The Doonsan Bears, a Korean professional baseball team, and the Korean national women's basketball team won the honors in the men's and women's team division, respectively. In the special prize division, Park Jong-chul, a disabled weightlifter, and the Jeonnam Sports Association shared the honors. "To instill Olympic ideals of friendship, solidarity and fair play in youth is one way to enhance the educational value of sports," said WTF President Choue in his welcome speech at the awarding ceremony. Dr. Choue said, "To attain that goal, IOC President Jacques Rogge proposed the creation of Youth Olympic Games and the proposed 2010 Singapore Youth Olympic Games will serve as a good opportunity for youth to share friendship and solidarity, as well as learn more about fair play spirit and peace." "In line with the IOC policy, we launched the WTF Taekwondo Peace Corps in July 2008 and dispatched the first Taekwondo Peace Corps members to seven regions in five countries and we plan to send the second Peace Corps members this coming winter," WTF President Choue said. "The Taekwondo Peace Corps program will ultimately contribute to the promotion of global peace." To promote the spirit of fair play and sportsmanship in the Korean sports community, the KFPC was launched in 2006. WTF President Chungwon Choue was unanimously nominated as the first president of the KFPC at its inaugural General Assembly in Seoul on Sept. 26, 2006. Since 2007, the KFPC has presented Korean Fair Play awards annually. The KFPC plans to recommend the prizewinners as the Korean candidates for the World Fair Play Prizes for the year 2008, which is organized by the International Fair Play Committee. The KFPC serves as the Korean national body of the IFPC, whose headquarters are located in Paris, France. The IFPC presents World Fair Play awards annually to famous and less-known athletes, coaches, teams, and organizations all over the world in three divisions: act of fair play, sports career, and promotion of fair play. Iranian Hadi Saei Bonehkohal, the triple gold medalist in the taekwondo competition at the Olympic Games, was voted by the IFPC as the World Fair Play for the Year 2005 for his humanitarian activities.